The New Hanover Soil & Water Conservation District is a local unit of Government governed by a five member Board of Supervisors. Three of these members are elected and two are appointed by the North Carolina Soil & Water Conservation Commission by recommendation of the local elected body. The current list of Supervisors and staff can be found on our staff page. The New Hanover Soil and Water Conservation District (NHSWCD) mission is to protect and enhance water quality throughout New Hanover County through land conservation, stormwater management, technical support to citizens and organizations, and conservation education and outreach activities. To achieve this mission, NHSWCD has contract relationships with New Hanover County, the City of Wilmington, the N.C. Department of Agriculture and Consumer Services (NCDA&CS) Division of Soil and Water Conservation, and the USDA Natural Resources Conservation Service (NRCS). These partnerships enable NHSWCD to deliver federal and state cost share money and professional technical assistance to New Hanover County citizens. NHSWCD will extend partnerships to anyone interested in promoting conservation practices in the county. Examples of partnerships include reaching out to the Wilmington-Cape Fear Home Builders Association and Wilmington Regional Board of REALTORS© to originate the Stewardship Development Awards Program. Soil and Water Conservation Districts (SWCD) were established across the country in the 1930’s in response to the devastating Dust Bowl and other critical conservation problems of the time. Dr. Hugh Hammond Bennett, a North Carolina native from Anson County, was instrumental in coordinating national efforts toward solving the conservation challenges that the country faced. Today, many soil and water conservation programs across the nation can be credited to Dr. Bennett. 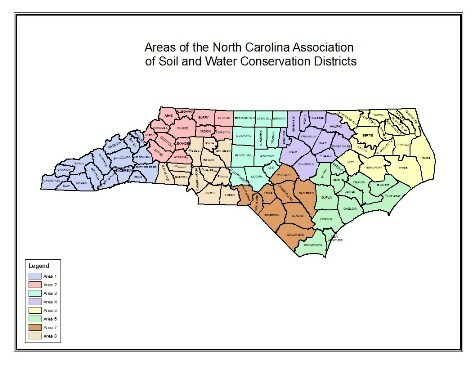 Soil and Water Conservation Districts were authorized under North Carolina General Statute 139 adopted in 1937. Districts are created locally and organized to plan and carry out a comprehensive conservation program for the local citizens. District affairs are managed by the local District Board of Supervisors with help from a small professional staff, along with individuals and groups involved in a coordinated conservation program, including resources from local, state, and federal agencies. This allows for governmental assistance in conservation programs to remain under local control. You’ll find 96 Soil & Water Conservation Districts across North Carolina’s 100 counties. These Districts are divided into 8 Areas (see top map). 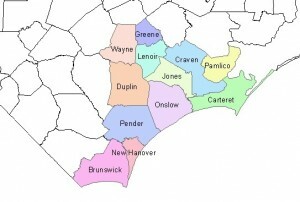 New Hanover SWCD is in Area 6 with eleven other counties (see bottom map). The New Hanover District approves soil and water conservation plans, identifies and plans local natural resource conservation work, presents conservation education programs to students and adults, and coordinates the conservation efforts of federal, state, and county agencies within the District.